With the publication of this book last spring, the Arthena association continues to pursue its very necessary and courageous work of editing monographic works on artists whose importance in art history has sometimes been forgotten. 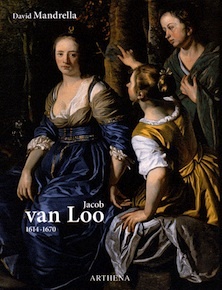 Although the van Loo name has become rather conventional over time, a facile attribution for a certain type of portraits which they made popular in Europe in the middle of the 18th century , David Mandrella’s work, based on his doctoral dissertation, highlighting the founder of this dynasty, Jacob van Loo (1614-1670), helps us to recall his role in Holland and France, in the mid-17th century. The editing work, once again remarkable, enables readers to fully appreciate the painter’s colors, his most admired skill. Although often remembered for the tragic episode resulting in his exile to Paris in 1660 , artistically his most famous painting in France, Young Woman Going to Bed (ill. 1) from the Musée des Beaux-Arts in Lyon, does not reflect the diversity of his production which ranged from genre scenes to portraits, and included also biblical or mythological compositions, at times repeated in different variations given their success among art lovers. Based on thorough work, with sources taken from numerous documents gathered in different archives, and in a pleasant style throughout, David Mandrella has managed to reestablish the influences and masters which the painter encountered both in Amsterdam, where he settled in 1635, and Paris where he mingled with many members of the Northern European artistic community . His talent was officially recognized here since he was inducted, as a portrait artist, into the Académie Royale de Peinture et de Sculpture in 1663 , seven years before passing away in Paris in November of 1670. Stylistically, Jacob van Loo is a representative of the "Classical" vein in Golden Age Dutch painting, reinterpreting the Italian models while adding a certain naturalism, particularly in the treatment of vegetation and skin tones. This current is embodied notably by Jacob Backer (1608-1651) who exerted an early influence on Jacob van Loo and, later by Gérard de Lairesse (1641-1711), whose presence can be felt in van Loo’s mythological compositions where the luminous treatment of the skin tones, as well as the elegance recall those of the second master. But Lairesse, an artist from Liège, conveys a "harshness" which is absent in Jacob van Loo’s work. He had already succeeded in establishing a clientele and a fine reputation in Amsterdam, where he married the sister of the painter Martin Lengelein (1604-1661), in 1643 and became a bourgeois there in 1652, confirming his status as a painter despite the presence of such great contemporaries as Rembrandt, Frans Hals and Bartholomeus Van der Helst. While his first portraits follow the tradition set down by Thomas de Keyser (1596-1667), he subsequently found his own style which was sought after in both Amsterdam, then Paris. In the period between 1650-1660, the French capital was definitely taken by his manner which reunited the Northern and French influences, as found notably in Juste d’Egmont (1601-1674), Philippe de Champaigne or Louis Elle Ferdinand II (1612-1689), who is, stylistically the most distant from van Loo’s art. 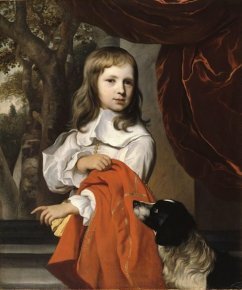 Less influenced by Van Dyck than by Juste d’Egmont’s portraits, the charming Portrait of a Young Boy with a Dog from the museum in Gray  (ill. 2), painted two years before he went into exile, is already more immediately seductive in its treatment than Philippe de Champaigne’s likenesses with their authoritative expression. His two surviving children would produce some church paintings but did not contribute to further enhancing the family’s artistic legacy. However, Jacob van Loo’s descendants in the 18th century would include portraitists whose fame would eclipse that of the dynasty’s founder, and become among some of the most famous artists of the French school. After the essay, the paintings catalogue, with 150 items, presents only acknowledged works which clearly confirm the characteristics of Jacob van Loo’s style and should be helpful in enabling future discoveries. The catalogue also includes some drawings, whose attributions are rather convincing and represent an important addition to this publication. David Mandrella, Jacob van Loo 1614 - 1670, Arthena, 2011, 288 p., 86 €. ISBN : 9782903239442. The style of Louis-Michel (1707-1771), the last of the line, can now be distinguished rather clearly from that of his father and uncles, Jean-Baptiste (1684-1745) and, the most famous of the van Loos, Charles-André, known as Carle (1705-1765). That year during a fight in an inn, he stabbed a certain Hendrik Breda who later died from his wounds. Jacob van Loo was forced to flee from Amsterdam and was later comdemned to death in absentia, banned from the Netherlands for life. The author will soon publish important documents, which could not be included in his monograph, concerning these circles and the production of Dutch artists present in Paris. His reception piece, the Portrait of Michel Corneille the Father, Painter and Rector of the Académie Royale today resides at the Louvre (inventory n° 1439, oil on canvas, 116.8 x 86.7 cm.). On this point, Emmanuel Coquery says, "a style of Nordic quality made up of attention to the brilliant materials, the smooth shadings, and the exactness of the description. But the poses and the attitudes of the figures, as well as the discreet idealization which he imparts on the faces, remains very French" (cf. the catalogue for the exhibition, Visage du grand Siècle. Le Portrait français sous le règne de Louis XIV, [ed. E. Coquery], Paris, 1997, p. 204). Signed and dated 1658. Although its model is still not known, this portrait became famous after the bequest of the Albert-Pierre Pomme de Mirimonde collection to the museums in Tours and Gray, since he appears on the catologue cover (cf. Elisabeth Foucart-Walter, Musée du Louvre : la collection A.P. de Mirimonde (legs aux musées de Gray et de Tours), Paris, 1987).